In the following guide, we will be taking a closer look at the TellDunkin Survey. Because the company cares about its customers, it has also set up a quick survey which can be accessed at www.telldunkin.com. In this article, we’ll take you through the steps of completing it, tell you about the rewards you’ll get, and mention the requirements you should keep in mind. In order to partake in the www.telldunkin.com survey, you need a receipt with an invitation and a code. Just make sure you share your experience within three days from your last visit. The TellDunkin survey only takes a few minutes to complete. For sharing your Dunkin’ Donuts experience within three days of your last visit to Dunkin’ Donuts, you will receive a free Dunkin’ Donuts doughnut on your next visit, when you purchase a medium or large beverage! All you have to do is keep the Dunkin’ Donuts validation code that you’ll receive when you complete the survey. Show the code to the Dunkin’ Donuts cashier the next time you visit one of their locations and you can claim your Dunkin’ Donuts prize. Completing the TellDunkin survey isn’t only going to get you a free Dunkin’ Donuts doughnut, but it’s also going to help you share your Dunkin’ Donuts experience with the company and improve your future interactions with them. Select your language from English or Spanish. Provide the store number, which is a 6-digit number on top of the receipt. Go through the questions (see the screenshots below for more info). For some you need to vote the quality of a service or product with grades from Poor to Excellent, while other questions require you to tick some choices. There are also fields where you can comment. The TellDunkin survey will ask for further details in case you marked some questions with an answer below “Satisfactory” in order to get at the core of what made you unhappy (if it’s the case). On the final tab, you have to give out your personal information. After you completed the TellDunkin survey, keep the validation code which you will receive from Dunkin Donuts and use it on your next visit to get a free Dunkin’ Donuts doughnut! 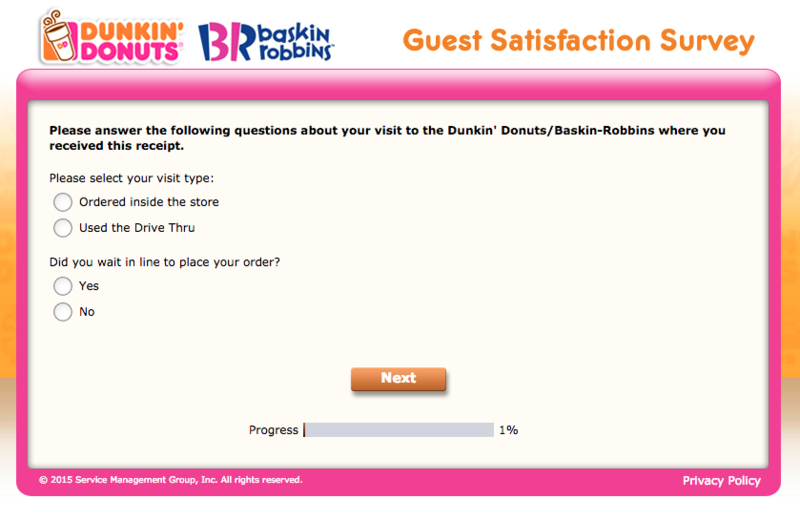 The www.telldunkin.com survey, screenshot no.1. The telldunkin.com survey, screenshot no.2. Best coffee great custumer service exelent management i love it store number 20 east Windsor Basit is really good making ice Coffee and really fast thanks so much .